I used to love that show. Enjoyed many a time after school with some rich tea biscuits or a Calippo wishing I could stop time like Bernard did. But never have I wanted that watch so badly than I have done since becoming a mum! 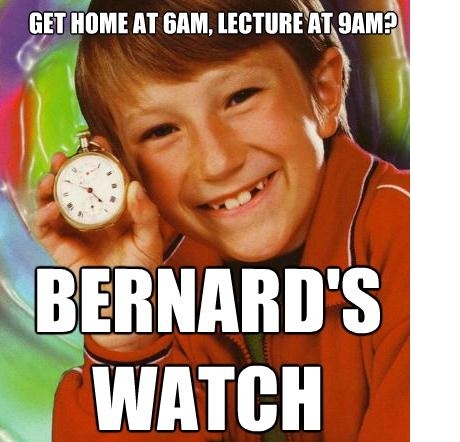 I used to wish for it the night before an exam, but that was just childsplay. This is serious now Bernard, hand me the watch or find me Harmony’s special 50p coin so I can rub the Queen’s nose and wish for more hours in the day! With Sophia’s wake time increasing and Oscar’s patience decreasing, I am finding I have less and less time in the day to get anything done! This usually means laundry taking the whole week to complete, spontaneous cleaning of random corners of the house at any opportunity, and the to do list getting longer, sadly. This sadness is made worse by the certainty that the corner cleaned moments ago is probably messy again now I’m at the end of this sentence, thanks Osc. I’d think you were a devil dog if you weren’t so damn cute! I used to wake up and make a mental list of the things I wanted to do in the day. Okay so I wouldn’t always get through all of it but I’d have a decent go. Now however, in SS time (Since Sophia), I’ve learnt not to even bother with a list or in the very least to make a realistic one! It’s still considered a list with just one item on it right? I exaggerate a little. What I mean to say is, I’ve learnt the importance of managing expectations of myself so as not to be continually disappointed! Motherhood comes with so many challenges, and learning not to create a bigger hurdle for myself to jump over has been my biggest one yet. It dawned on me when my husband causally said one evening ‘You do make things harder for yourself you know!’ in response to a meltdown of some kind. Although it did almost cause an eruption of volcanic proportion, after calming down, I soon saw that he was right. I was putting so much pressure on myself unnecessarily and it was on these days particularly that I didn’t enjoy it, I was overwhelmed! So what now? Now, I try to celebrate the little victories at every opportunity (cue mental Carlton dance). And I do mean little. I am winning when I manage to keep Sophia entertained in her cot long enough to squeeze in a morning shower. When I successfully do both Sophia and Oscars morning routine AND get breakfast for myself: Win. When I pilot a walk with both of them alone: Win. When I crochet more than one row in one sitting: Win. When I eat my dinner and it’s still hot: super WIN. You get the idea! I felt silly at first but it works! It reminds me to not be so hard on myself and I can honestly say I am enjoying being a mum so much more because of it. Sophia is happier and more relaxed too. And so is Oscar for that matter! I read a blogpost some time ago on a similar theme and this stuck with me ‘Learn to accept that unfinished is ok, unfinished is enough’. That post was right, it IS enough. Don’t dwell on the things you haven’t done on your list. Dwell on the things or half a thing that you have done. However big or small, it is a hard earned victory. And the sooner you realise it, you’ve won already. So Bernard, it looks like I don’t need your watch after all, I’m doing just fine without. Carlton agrees. Mother Nature is meaner than Regina George.